Tune in to Cereal Music this Monday, May 26th at 9:30am for two special interviews. 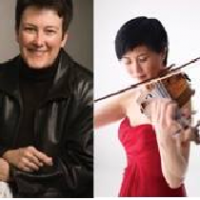 First, at 9:40am, an interview with violinist Jennifer Koh, and then at 10:30am, an exclusive interview with composer Jennifer Higdon. Also on air throughout the program will be works by Higdon, including a broadcast of Koh's recording of Higdon's The Singing Rooms. Violinist Jennifer Koh is recognized for her intense, commanding performances, delivered with dazzling virtuosity and technical assurance. She is dedicated to performing the violin repertoire of all eras from traditional to contemporary, believing that the past and present form a continuum. For more information, go to www.jenniferkoh.com.